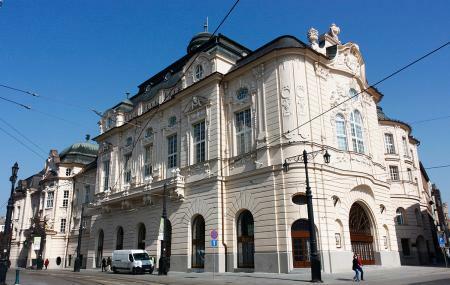 A national pride of Slovakia, the Slovak Philharmonic is inseparable from Bratislava. Seeing an impeccable Orchestra playing smooth notes to give you an experience of a lifetime, the Slovak Philharmonic hosts some of the best shows in town and even has its own tours throughout the world. If you love music the old-school way or simply want to be a part of the magic (the old building, acoustics, the skilled musicians), do catch a live show here. If you don’t have time to watch a live performance, the building is ideal for a quick stroll to admire its architecture and design. Prices vary per shows but discounted rates are available for Citizens, Seniors and Children. Call up the place or visit the official website for more information. Visit the official website for precise show timings. How popular is Slovak Philharmonic? People normally club together Slovak National Theatre and Period Rooms Museum while planning their visit to Slovak Philharmonic. A beautiful place with a fantastic orchestra. I was lucky enough to hear them play Wagner and it was wonderful. Comfortable chairs, great facilities. Absolutely incredible experience. Building is beautifully preserved and sound of the orchestra in the historical building like that is just a bit away from being perfect. Only downside is the bar, which during break doesn't have enough capacity to serve everyone. A must see for anyone visiting Bratislava. The concerts/performances are reasonably priced: €10 - €20, and the quality of symphonic music is always of the highest order: Brahms, Schostakovich, Tchaikovsky, Mahler and so on. A brilliant venue. It's worth a visit simply to appreciate the grandeur of the interior. Very very good place, unique building with unique ambience. I have been there on several occasions, recommend the program of the as very good event for non Slovak speakers. Also if you find your self there on company event you will experience a lot of nice food and drinks in the unique and atmosphere of the Reduta. Wonderful architecture and concert. Right in the old town, you should go the a concert in the national old Philharmonic.